At the East Troy Community School District, our goal is to increase current connections with young families that develop and foster relationships between the school district and parents/guardians, to ensure physical, social/emotional/behavioral, motor and cognitive developmental milestones* are being reach by all children aged 0 – 4, to maximize the school district’s ability to provide a year plus of learning growth each year a child attends school in the East Troy Community School District. Finally, to assist and involve parents with using every day moments to make extraordinary educational moments for their child. 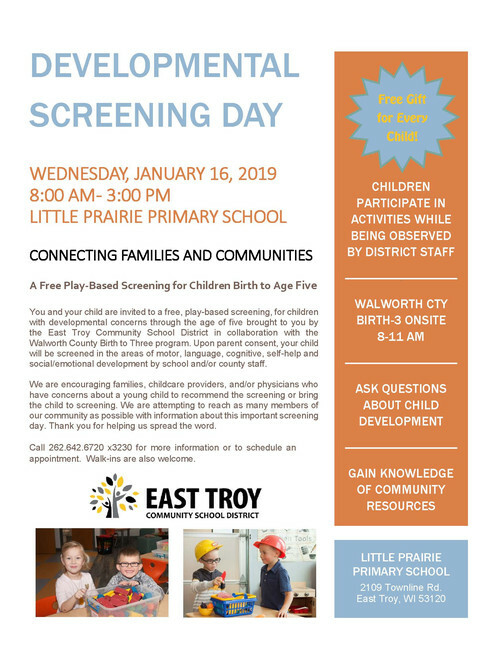 As a part of our ongoing Child Find efforts, the East Troy Community School District will be hosting a Child Developmental Screening Day on Wednesday, January 16, 2019 from 8 am to 3 pm for children ages Birth to 5 years old with development concerns. We are encouraging families, childcare providers, and/or physicians who have concerns about a young child to recommend the screening or bring the child to screening. We are attempting to reach as many members of our community as possible with information about this important screening day. Thank you for helping us spread the word. As part of this screening, children will participate in a variety of activities with district staff in a play-based setting where speech and language, preschool readiness, fine and gross motor, self-help and social skills will be observed. While the children participate in the screening, members of our district staff and community resources will be available. A staff member from the Walworth County Birth to Three program will be on site from 8 - 11 am to screen children and discuss concerns that families may have regarding their youngest children. All children who participate in the screening will receive a free gift! Call Jennifer Marcinkevic at 262.642.6720 x3230 for more information or to schedule an appointment. Walk-ins are also welcome. We look forward to meeting our community's youngest learners! Stay and Play is designed to promote play and social development and offer safe and meaningful interactions and much more for East Troy families with infants and children to age four. There is no need to sign-up and you do not need to attend all sessions. Drop in anytime within the time frame. For the safety of our students, please enter through the front door and sign in. Parents are required to stay and supervise children. Child Find is an ongoing process to locate, identify and evaluate all children, from birth through age 21, with special education needs. Your child is important to us! Please provide us with information about one or more of your children in order to receive future offers and helpful information about topics of interest to you and your family. Your information will not be shared with any 3rd party vendors.